Developers Naughty Dog has created one of the most celebrated character in our current console generation; they gave us the ever lovable disaster magnet: Nathan Drake. The Uncharted series was an homage 90s action adventure films with their over-the-top set-pieces and a protagonist who possess a distinctive swagger that attracts the ladies and bullets, the series was a hit with both critics and gamers alike. First announced in 2011,The Last Of Us would be Naughty Dog’s first foray into survival horror, some doubted the ability of Naughty Dog to create a compelling game about survival however I am here to tell you that The Last Of Us is one of the most intense and horrifying game(at least the parts I got my hands on) I’ve played so far this year – narrowly beating out Metro Last Light. The Last Of Us tells us a compelling tale of grizzled Joel and young Ellie and their journey across a post-apocalyptic America, avoiding the “infected” and fighting off other survivors. In the Last Of Us, Humans turned into monsters after being exposed to a terrifying type of fungus, these “infected” now roam the streets mindlessly looking to tear into any living human that are unfortunate enough to meet them. 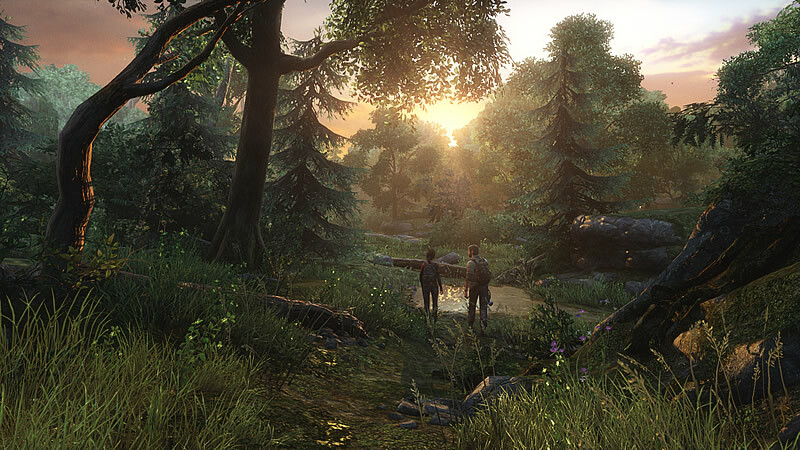 The first level I played opened up in Lincoln, Pennsylvania (or what remains of the once vibrant city) with Joel and Ellie trekking into the city in search of Bill, an old “friend” of Joel. After encountering a roadblock, the duo was forced to take the scenic route into the city itself. I was blown away by how good the game looked. The early evening sun bathed the rusted cars and dense foliage in gold. The environment itself told us a story about the world, humanity is on the brink of extinction and nature had reclaimed mother earth. As I continued trekking into the city, Ellie (who was born in safe zones after the fungal outbreak) started to comment on the surrounding flora and fauna. When Ellie said “These are fireflies, real fireflies” while she danced with them, that moment struck me as it showed the naivety of Ellie – it showed me that beneath the foul mouth and cocky attitude, Ellie was still an impressionable young girl. Unimpressed, Joel pushed her along and they continued walking. Within a span of just 30 seconds, the game showed us the dynamic relationship between the 2 characters. Fleshing them out as real believable human beings instead of usual generic cookie cutter characters that we’ve seen a hundred of times. These interactions helped build a bond between Joel and Ellie, much like the bond I felt as Booker with Elizabeth however unlike Elizabeth, Ellie’s mortality brings a whole new dynamic to the game. After a short walk, I finally reached the city proper however there was just a tiny little problem – the side gate leading to the city was locked from the other side. So I took a detour and found a boarded up old shack with a detached air-conditioning unit that I can climb on. Intuitively I pushed the X button and before I knew it, I was already on the roof of the shack and I needed a way across the fence. As I looked upon the compound from my vantage point, I saw a unusually long plank of wood down below which would serve well as a makeshift bridge. So down I went to fetch bridge, there was a real heft and weight to the plank as Joel grunts while carrying it over to the shack. After crossing the fence, I looked towards to horizon and finally saw the city proper. A short jump and I’m finally in the city. There was an eerie silence, the city was desolate and empty. Abandoned cars strewn along the roads, houses looted clean and stores ransacked. As I made my way deeper into the city, I heard a eerie clicking noise and out comes a special “Infected” type called the Clicker, the resulting conflict was quick as my neck was bitten off the second I was within arm’s reach. I restarted from the previous checkpoint, I grabbed a nearby brick and threw it against a wall to attract the attention of the nearby clicker. Like the previous encounter it made a beeline towards me but this time I was ready, I hit it with my trusty lead pipe, each hit impacts with a heavy thud and brutal bone-shattering crack. After 3 hit bone shattering hits, the Clicker finally died. 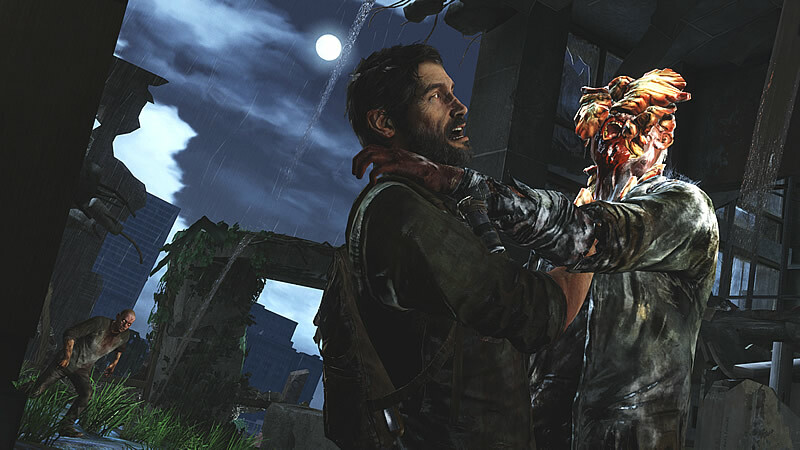 The encounter would be easily resolved if it were an Uncharted game (just keep pumping lead until the enemy is dead) however Joel’s limited combat ability lends a certain intensity to the combat. First off ammo was scarce, Joel’s default pistol only held 9 rounds and after scavenging the surrounding area I found 3 extra rounds. With only 12 rounds, I was forced to pick my shots which is actually harder than it looks because of the recoil from each shot. Secondly, almost all of your adversaries would start SPRINTING in your direction the second you got detected. Finally, most special “Infected” types could kill you with an extremely cheap “insta-kill”. After my first encounter with the infected, I came across a locked door which required a shiv to open. The item crafting system feels like something that leaped out of Dead rising, you are able to create new items out of “Junk” you pick up in the environment. Crafting is done in real time so I had to be absolutely sure that there was no hostiles around before I start the crafting process. A single shiv required a pair of “blades” and tape which I had plenty of, a few seconds later and viola. I opened the door to discover that it’s an abandoned office space with some items and 3 revolver rounds. Exiting out the back door, I found myself face to face with another gate locked from the other side but this time Ellie suggested that Joel should boost her across and she’ll unlock the gate from the other side. Joel resisted the idea at first insisting that it was too dangerous for Ellie however Ellie persisted and Joel finally disgruntling agrees as their options are limited. After opening the gate, I walked down a wide avenue of the once bustling city. While continuing on my goal to locate Bill, an open door caught my eye and after walking in did I discover an abandoned record store. As Ellie eagerly flips through records, 1 single line of dialogue materialized the bleak world of The Last Of Us “It’s sad, all this music just left here with no-one to listen to it” she said. A detour to the back alley indirectly introduced us to Bill after a charging Clicker was blown to smithereens by one of Bill’s tripwire traps. The following few sections kept me on my toes as I had to carefully disarm more of Bill’s traps while tackling more Clickers. I proceeded into a seemingly empty room as we got closer to Bill and BAM, I was hit by one of Bill’s traps which hung me by my heels and to make matters worse the ruckus attracted a horde of infected who are now bearing down on my helpless body while Ellie attempt to free you. This portion was THE hardest part of the demo, not only do I have to kill the charging clickers, I also had to ensure the safety of Ellie by fighting off her attackers. After Ellie managed to free Joel, hordes of infected had already managed to swarm the area and when all seems lost; in comes Bill to the rescue ! Joel and Ellie managed to escape by the skin of their teeth but celebrations were cut short after discovering that the Laundromat they escaped into had been breached by the infected. With Bill providing cover fire, the trio finally made it back into Bill’s safehouse. After reaching the safehouse, Bill was outraged by the sight of Joel, cuffed Ellie to the door and threatened both their lives just because he was mildly suspicious of her. Bill was in short a nutjob but he was a nutjob that Joel needed. After defusing the situation, Joel told Bill what he needed him for; a car. The demo ends there. This was just one of the missions that I managed to get my hands on, I’ve not written about the greatest monster in this game, the depravity of the fellow survivors. I guess you’d need to read our full length review in the next issue to find out more.